Here’s an exciting salad that takes the concept of chicken and veggies to a whole new level! There is so much going on in the flavor department like sweet mango, savory chicken, tender asparagus, tangy arugula, and creamy goat cheese. The herb marinade for the chicken is a total winner – don’t be surprised to find yourself using it often! 1. Combine the herb marinade ingredients in a small bowl. Place 1 Tablespoon of the marinade in a large Ziploc bag with the asparagus pieces, and the rest in another large Ziploc bag with the chicken breasts. 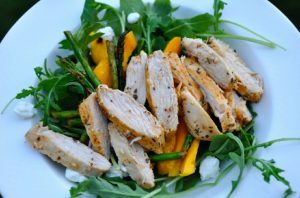 Make sure the chicken and asparagus are fully coated with the marinade, and then place in the refrigerator for an hour. 2. Heat a grill pan and another medium pan. Place the chicken breasts on the grill pan, and cook 4 minutes each side, until there is no longer any pink in the middle. Sauté the asparagus in the medium pan, stirring often while the chicken cooks. Remove both pans from heat. 3. Once the chicken has cooled, slice each breast into even strips. 4. In a large bowl combine the arugula, mango slices and crumbled goat cheese. Add the cooked asparagus and the chicken. Mix and serve.